Commodore Amiga ADF Disk Public Domain Game Images RetroPi PC Emulators. 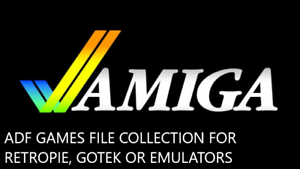 Commodore Amiga ADF Disk Collection - PD, Music, Demos and Apps 67GB 66,000! Commodore 64, VIC20, And Other 8bit CBM Emulators for PC's with over 7000 games. adster1988 has no other items for sale. A++ Awesome seller, best service, great product, very fast postage!